You may well have heard some recent media coverage on a decision to be made soon on the status of Pluto. There has been much speculation in recent years on the question "what is a planet?". The recent press coverage stems from the 2006 International Astronomical Union (IAU) meeting in Prague, which takes place this week. The IAU will be debating the issue, and has promised to announce a definitive definition in September. LATE NEWS - Phil Plait at the Bad Astronomy Blog is saying there will be some sort of news later today on Pluto. It worth remembering that this is not a debate just about Pluto, and whether it is a planet or not. The debate is much wider than that. Any definition has to take account, not only of the many Trans-Neptunian Objects in our own solar system, but also the many other planetary systems we have discovered around other stars, in the last 10 years or so. So should Pluto be a planet or not ? Well my view is yes. Not for the sentimental reasons some people advocate. I'm really not that bothered whether Pluto survives as a planet or not. Lets face it Pluto has only been know as a planet for 76 years (Halley's comet make one orbit of the sun in that time, and we've known about Halleys comet for hundreds of years). Before Pluto was discovered asteroids like Ceres and Vesta were discovered and considered as planets, until our understanding improved and there were 'demoted' to minor planets. If you somehow exclude Pluto as a planet you have to do it by some arbitrary limit in either size or orbital distance. If you do that you are basing your system on what you know about our own solar system. 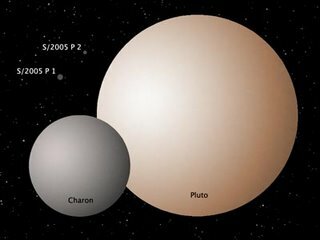 For example you might say anything smaller than Mars isn't a planet, or anything bigger than Pluto is. But how does that apply if you discover a body only slightly smaller or bigger than the limit? Or what about a similar sized body around another star? Using orbits as an example if we class anything orbiting further away that Neptune as something other than a planet, how does that relate to other planetary systems. Many of the extrasolar planets we have found orbit their stars in a zone closer than Mercury orbits our sun. Does that mean they shouldn't be planets because they orbit too close ? "A planet is a body that directly orbits a star, is large enough to be round because of self gravity, and not so large that it triggers nuclear fusion in its interior"
That clears up a lot of the confusion, and applies to any foreseeable planetary system we may discover. Under this scheme Pluto, UB 2003 313 and several other objects in the solar system would be planets. However, there are still some problems. What do we mean by 'round'? Jupiter is certainly a planet by most people's definition but is not spherical because it bulges significantly at the equator ! Also what does "directly orbits a star" mean? What does a 'star' mean for that matter? What about a 'planet' that orbits a brown dwarf? Some astronomers have suggested terms like 'Fusor' and 'Planemo' to further refine the definitions. All of which goes to show that there is no easy answer. Perhaps it's time we abandoned the term planet altogether ! Anyway I'm sure the combined brains of a couple of thousand planetary scientists will come to a sensible conclusion. We just have to wait and see. Hopefully we'll soon know the definitive answer to that seemingly simple question "How many planets are there in the Solar System?". The Planets Debate Goes On . . . .